Serving nearly 20 years in the UC system, I have focused my work on improving the student experience, developing an expertise in managing complex academic support systems and improving processes and outcomes that assist students in meeting their educational goals. Outside of my job function, I have also developed an interest in understanding the complex UC System and working to improve the staff experience. Since joining UCSF, I have been an active member of Staff Assembly (serving as Secretary and Regent’s Observer), Black Caucus (serving as Communications Chair) and the UC administrative Management Professionals as well as currently serving as Co-chair for the Staff Subcommittee for the Council on Campus Climate, Culture and Inclusion (4CI). 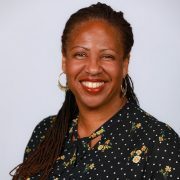 I am dedicated to ensuring staff members are appreciated and valued within the UC system and I am honored to represent UCSF by serving as CUCSA First-Year delegate on behalf of all non-represented staff.